Our inaugural social justice fellowship program kicked off in December 2017 and ran until April 2018, focused on the theme of racial equality and inclusion. We received over 60 nominations and applications, ultimately selecting 15 extraordinary individuals to be part of this pilot program. It was the first platform in Hong Kong to bring together local, refugee and migrant ethnic minorities and their allies together under one unified banner. Through opportunities and support from Resolve, the fellows were able to deepen their understanding of laws and policies about racial discrimination while enhancing their organizational and leadership skills to work towards raising awareness in Hong Kong about diversity and inclusion. We hope the fellowship can help build future community spokespeople and inspire a new generation of social justice leaders. Read more about the theme, the fellows, the program highlights and impact below. If you are interested to be part of our 2019 Fellowship, find information here. The reason we chose racial equality as our first theme for our fellowship program was because this was one of the more neglected issues in the inclusion space, and yet quite important. Many ethnic minority groups are at a higher risk of being socially excluded and falling under the poverty line; and these trends have only worsened in recent years according to a 2016 study. Xenophobia and negative stereotyping towards refugees, migrants, and local ethnic minorities has worsened in media coverage, negatively affecting public perceptions. However, a recent survey found that 80% of the respondents were keen to learn more about ethnic minorities, indicating that there is a need for further information and members of these communities are the best messengers for providing this. Moreover, in August 2018, Hong Kong was reviewed by the UN Committee on the Elimination of Racial Discrimination for the first time in almost a decade, providing a critical window of opportunity to build momentum on this issue and push for legislative, policy and society change for a more inclusive Hong Kong. We hoped to foster more voices, in a more united way, to speak up on racial equality and support civil society. The fellows got their first introductions to each other at a welcome dinner that we hosted on November 30, 2017 with them as well as the Resolve team, volunteers and advisors to the program. We did some icebreakers (thank you InnovatorsBox!) and one-to-one introductions for everyone to get to know each other better. Thank you to Tamarind restaurant for hosting. Workshop 1 was hosted at Thomson Reuters and focused on the fellows gaining better understanding of themselves and each other. We kicked off the morning with Team-Building Asia, guiding the fellows through exercises that fostered better self-awareness of their personalities, group work to learn to work together, and norm setting among the fellows to support the entire duration of the program. There was a lunch panel event that brought different community leaders to share and discuss their own leadership journey, which included Chong Chan Yau from the Hong Kong Blind Union, Eni Lestari from the Asian Migrants Coordinating Body, Arash Bordbar from the Asia Pacific Refugee Rights Network and Sze Lai SHan from Society for Community Organization. In the afternoon, the fellows were able to share their own personal stories and trajectories among themselves, building cohesion and trust among the group. Workshop 2 took place at Skadden, Arps, Slate, Meagher & Flom LLP on the topic of racial discrimination. We kicked off the morning with a session facilitated by Amnesty Hong Kong on the history and origin of international human rights and the UN human rights system. Then fellows explored previous racial equality social movements to get a sense of effective campaigns. 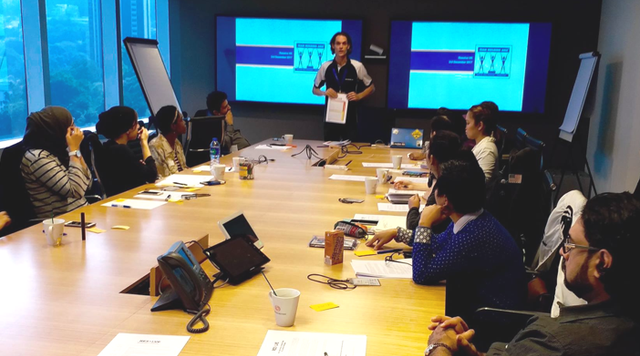 After a lunch where the Final Project and Team-Coaching aspects of the fellowship were introduced, the Equal Opportunities Commission conducted a session on Hong Kong’s Race Discrimination Ordinance. Jeffrey Andrews from Christian Action and Law Yuk Kai from Hong Kong Human Rights Monitor then discussed the history of the movement for racial equality in Hong Kong and the work done by civil society to advance the RDO. Fellows became familiar with the laws and policies protecting Hong Konger’s rights and how to exercise those rights. In the afternoon, Community Business facilitated a discussion on how the fellows can foster diversity and inclusion in their own work. Workshop 3 was hosted at PwC with a focus on strategies and methods fellows can use to achieve their goals. We kicked off the morning with a panel discussion with a diverse group of community leaders who successfully helped bring about social change using different tactics and making compromises along the way, including Haider Kikabhoy from Walk In Hong Kong, Eman Villanueva advocate for domestic workers, and Suzanne Wu from Oxfam. The fellows then reflected on the panel and analyzed common variables present in the examples, as well as exploring different advocacy tools, factors, and considerations. After lunch, our advisor Christine Cheong from Step Ahead Consulting facilitated a group coaching session based on the norms discussed during Workshop 1. Later in the afternoon, Rights Exposure guided a session on discussing and planning for the Final Project, exploring strategic frameworks and tools for putting together an audiovisual storytelling campaign. Workshop 4 was again hosted at PwC, this time focusing on ways to move a vision from paper to practice. Fellows were exposed to ways to turn complex ideas into specific goals and objectives, and the importance of setting SMART indicators and monitoring and evaluating progress. Daniel Man of HK Citizens then discussed different ways to get a community organized and motivated. Later in the morning, Judy Kan, Executive Director of HER Fund, and Kelvin Cheung, COO of The Good Lab, discussed the importance and how-tos of getting funding and support for social justice initiatives. In the afternoon, fellows had time to continue their discussion and planning of the Final Project. The workshop ended with a mid-way evaluation of the program, with the Department of Social Work at Chinese University of Hong Kong guiding a discussion and reflection of the program so far. Workshop 5 took place at Hogan Lovells with a focus on media and communication. Monica Zionede Hall of Feliz Consulting first facilitated a session on the importance of communication for social justice leaders particularly in cross-cultural contexts, as well as the elements of effective communication, such as self-awareness. Sam Bobertz from Starmaker then guided the fellows in the art of storytelling and fellows had a chance to craft and practice their own personal narrative. In the afternoon there was a panel on effectively engaging the media, with speakers including Eddie Lee of SCMP, Jim Hoe from AIDS Concern, Noreen Mir, the host of the 1-2-3 Show on RTHK3, and George Chen, Head of Public Policy at Facebook for Hong Kong & Taiwan. Afterwards, the fellows had an opportunity to apply the discussed concepts to the Final Project and to think about which stories they would want to include. The last workshop also took place at Hogan Lovells and was on the topic of self care. The fellows explored the idea of public versus private self and how to deal with personal privacy protections as one’s public presence increases. Later in the morning, Chloe Martin, an expert on trauma and its effects, gave a session on understanding and recognizing burnout, from a psychological and social justice perspective. After a lunch break, Ajmal Samuel, a businessman and disabilities advocate, and Bess Hepworth, Founder & CEO of Planet Ally, shared their personal journey of facing hardships and building resilience. Later in the afternoon, Bridge Partnership facilitated a session on self-care, discussing tools for checking in with one’s emotions and staying positive and motivated over a long struggle. The closing ceremony and celebration of Resolve’s launch & inaugural fellowship took place on April 28, 2018 and was attended by 120+ guests. 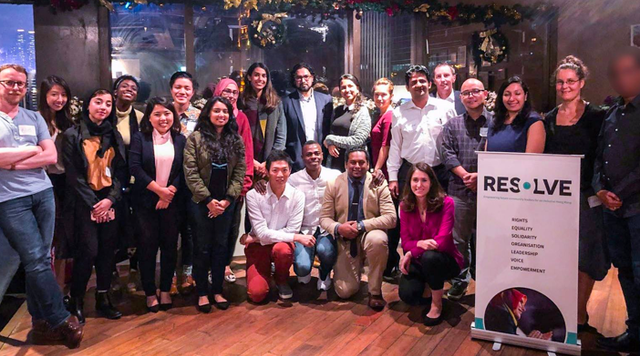 The fellows, Resolve team, volunteers, and supporters, enjoyed a graduation ceremony where the fellows received certificates, followed by sharing about the program’s highlights and Resolve’s contributions to an inclusive Hong Kong. Thank you to our event sponsors, Mettā, Dining Concepts, U.S. Consulate General Hong Kong and Macau, Feliz Consulting, and LUSH Hong Kong. In August 2018, we supported our 2018 alumnus Darius, to join a civil society delegation attending the United Nations Hearing on Racial Discrimination (UNCERD) in Geneva! Darius gained an understanding of as well as opportunity to practice lobbying people who have influencing power, building a network, and being flexible. We would like to give a special thank you to 香港人權監察 Hong Kong Human Rights Monitor, Hong Kong Unison 香港融樂會 and Centre for Comparative and Public Law, HKU for coordinating the civil society work and working with Darius to improve the situation for minorities. Thank you to the following organizations for their support of the 2018 Fellowship.